I hadn’t been to Silver Falls State Park in almost 20 years, somewhat pathetic considering it is Oregon’s largest state park at 9000 acres. The park boasts many waterfalls, and one hike connects most of the big ones. I headed there this afternoon to see some of these falls. I didn’t have time for the entire Trail of Ten Falls, but I created a loop hike of my own that visited 5 falls. In the early afternoon I parked at the North Falls Trailhead. The small lot was close to full, so I felt lucky to get a spot. My first waterfall was Upper North Falls. It is less than a quarter mile up a spur trail that is virtually flat. The falls are 65 feet high in broad punchbowl formation. It’s not the most dramatic waterfall, but it is very pretty setting, and the large pool below was surely tempting for the swimming-inclined. Looking down on the canyon and North Falls. Downhill the trail splits, and I opted for the Canyon Trail rather than the Rim Trail, on which I would later return. Shortly there was a view from above of the North Falls. It is a good sized beast at 136 feet, and the trail starts higher than the top Thus I found myself descending a considerable set of stairs a switchback before sliding behind the falls. Way behind. Approximately 50-60 feet of horizontal rock extend overhead from the trail as I gawked at the falls. Not too shabby. That’s when my camera died. Brilliant. I took only mediocre cell phone shots from there to the end. I spend some time at North falls, then motored onward. There is a junction a bit over a mile down the fern and fir coated canyon. For now, I moved past, barely spying the relatively diminutive Twin Falls around a rocky corner. I opted to continue to Middle North Falls and was pleased with the choice. The main trail did not go behind the falls, but a side trail did, and only a few people wandered down there, making it a very peaceful setting. After relaxing and enjoying the views for a while, I retraced my steps to the last junction from there. The side trail climbed a side drainage to the barely-there Winter Falls. A short distance above that, Above that, I veered left on the Rim Trail, which headed to the North Falls Trailhead through a beautiful forest with a couple of great views toward North Falls. Another great afternoon in the woods. 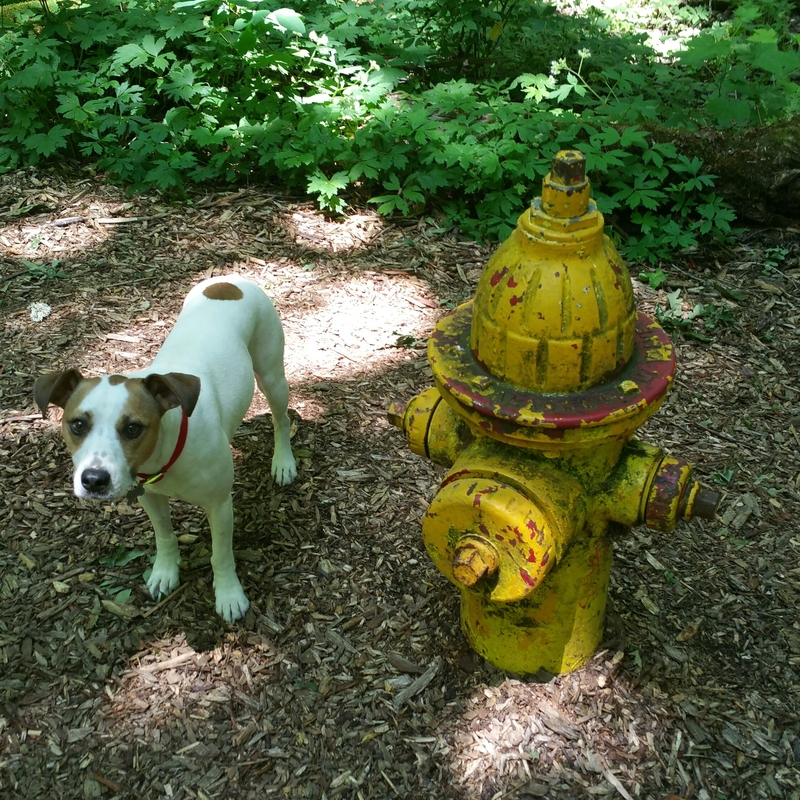 A weak but game Jackie Chan finds a hydrant in the Mary S. Young woods. Our pup Jackie Chan is sick, having been diagnosed this week with megaesophagus. We learned that after he’d spent ten days unable to keep food down. We will have to change the way we feed him for the rest of his life. This requires a vertical position, during and after feeding, which is a challenge until we get a custom chair. Now that we know how to do it, he is keeping food down and hopefully getting stronger. My wife Denise has had her own challenges in the past few months, many stemming from a crushed heel bone. It is no ordinary break. Six months later, while I am feeling lazy, it’s finally time for a family hike. Exit from the woods to the head of the open fields. Mary S. Young State Park is not dramatic like Smith Rock or Silver Falls, yet it offers ball fields, access to the bank of the Willamette River, and plenty of easy hiking trails, which was perfect today. Denise, Jackie, and I took a walk on the Blue Heron Creek Loop Trail. The trail was flat for a while, meandering among oaks, alders, and Douglas firs, but there were two sections of switchbacks when it crossed small canyons. Out in the open, the sun had been beating down, but the forest was a very pleasant temperature. There were some fantastic old growth trees. Because Jackie was still weak, we did not complete the entire Blue Heron Creek Loop, but took a shortcut down a paved path back to the parking lot and air conditioning.